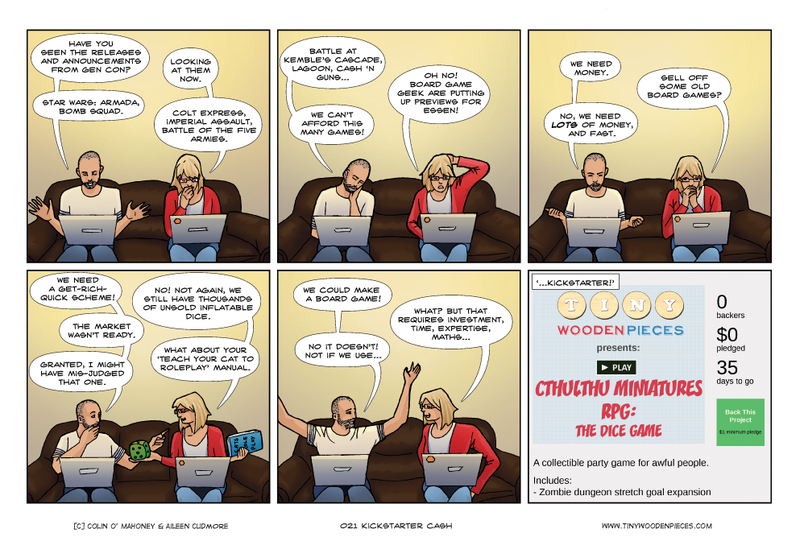 The list of exciting new from Gen Con in the comic is only partial, of course. There was a lot. As time goes on, however, I find I have gotten better at buying games. Or more to the point, not buying them. It’s not that I’ve become more discerning necessarily, more that I can better navigate the tricky waters of board game releases. I can browse, watch videos and read press releases with less chance of getting caught in a vicious undertow of hype and surfacing with a large dent in my credit card sustained while pre-ordering a large box of tiny wooden pieces I won’t get for another 2 months. Not that I don’t get caught in hype at all, of course. Gen Con had some must-buys, no doubt about it. Imperial Assault, as mentioned last week, and X-Com are top of that list. But with both I will be following news closely, and keeping an eye on how they play out, both figuratively, and literally. And by now I have a short list of trusted review sites to help steer me. I don’t always agree with these sites, but you can tell a lot from a review, and sometimes what you can tell is that you don’t agree with the reviewer. Of course, it helps that as our board game collection grows we need to be more certain that an upcoming game will have a place in it. Will it replace something, fill a niche, appeal to a certain group? Or will it just clutter the floor (the shelves already being full). There is no point in buying a game if all it will do is add the cat’s claustrophobia. As for Kickstarter, I don’t actually have a problem with it, it’s just too big a target in gaming right now to not take a swing at. Sure there are some (probably plenty) of board games that should not be on there. Games that don’t look like they would survive one round of decent playtesting, and games Kickstarted by companies that don’t by any means need the capital. And certainly there are a glut of cynical, off-putting stretch goals. Worse of all are the Kickstarter campaigns where you get the game at a certain level of backing, but unless you up your pledge enough to get all the stretch goals you’re not really getting the ‘full’ game. I’m much happier backing a campaign where stretch goals are added to all copies of the game as long as certain goals are reached overall. Of course, living where we do (Ireland) Kickstarters are generally rendered a moot point by shipping costs that often come close to the game itself that is being shipped. It seems to be both a common issue, and common cause for complaint. And yes, Kickstarter is also full of miniatures and zombies and all the usual suspects that board games would seem to already have an overabundance of. But the other side of that coin is that anyone can get a game to Kickstarter. Games about bees, ants, lumber-jacking, Jane Austen themed-match-making, all kinds of interesting themes and mechanics from unheard-of designers have a chance at succeeding, at maybe getting a game off the ground that a publisher would be unwilling to take a risk on. Our board game webcomic buddy The Author M is Kickstarting a board game about croquet. I have no idea if the game will be any good or not, but am I glad of a service that allows a game called Killer Croquet a chance at being published? You’re damn right I am. And ultimately, Kickstarter is 100% democratic. If you don’t like it, don’t donate, and that’s really all there is to it. Kickstarter has undoubtedly had a massive influence on the development of tabletop games in the past few years. However, I’ll be the first to admit that I know very little about the whole process. So instead of rambling incoherently about it here, I’ll point you in the direction of Tom Vassel’s Board Game University podcast with Richard Bliss, where they engage in a wider discussion about crowdfunding and Kickstarter in particular. Making a decision on what game to buy next can be really tough, especially if you are on a budget. You want to be sure that you will enjoy the game and get plenty of use out of it. It helps if you’ve actually played the game before; then you’ll know if it’s something you’ll want to replay again and again. But when we were first getting into the hobby, buying a new game was always a bit of a risk, a leap into the unknown. At that stage, neither of us had played enough games to know what mechanics and themes best appealed to us. So we kinda had to try a whole bunch of different ones out. And we sometimes would end up with a game that, for whatever reason, mostly just serves to sit on our shelf looking pretty. But that’s okay, because now we have a much better idea of whether or not we’d like a game simply from the description, regardless of what any review might say. More importantly, we know what type of game we’re willing to invest in and spend our precious pennies on. That’s not to say that I’m never swayed by other factors when considering a game. I’ve a particular weakness for gorgeous artwork (who doesn’t?). Just this week, I was looking at the sumptuous board of Realm of Wonder with its beautiful miniature figures, and I just want to hold them in my hands! Sigh. What can I say? Sometime the heart does rule the head.